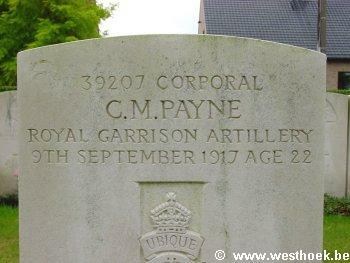 Fitter C M PAYNE 39207 18th Siege Bty., Royal Garrison Artillery who died on Sunday 9 September 1917. Age 22. Cpl. 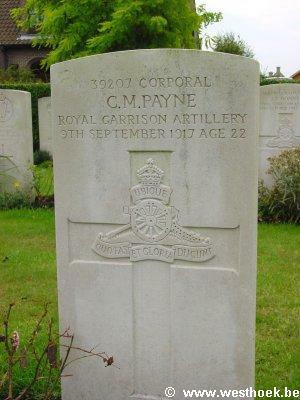 Charlie Payne, age 22, Royal Garrison Artillery was killed on 9 September 1917 and was an acquintance of Tubby Clayton (talbot House) before the war. He found a carving with a kneeling monk in the ruins of Vélu (Somme) and brought it with him for the Upper Room at Talbot House. However he was killed before he could deposit his gift. After Charlie's burial at Duhallow ADS Cemetery, his battery gave the kneeling figure to Tubby, who put it in the Upper Room. (Info : Brochure 'Talbot House', vzw Talbot House van Poperinge) Fitter C M PAYNE 39207 18th Siege Bty., Royal Garrison Artillery who died on Sunday 9 September 1917. Age 22. Son of Mr. S. H. Payne, of 89, Manor Rd., Kingston, Portsmouth. DUHALLOW A.D.S. 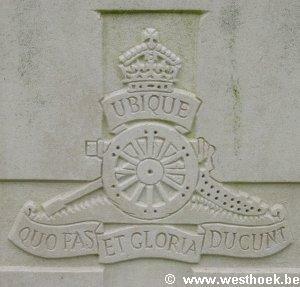 CEMETERY Grave VI. C. 6.